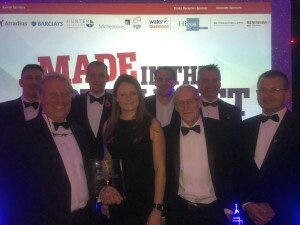 SC Group has collected two prestigious business awards this week, both from Insider Media. SC Group was honoured to win the National Award for Aerospace and Defence at the Made in the UK Awards 2017 and also the Medium-sized Company of the Year 2017 at the South West International Trade Awards. 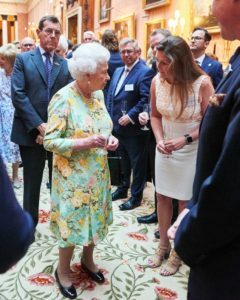 The National Award for Defence and Aerospace was awarded to the company deemed by the judges to have made the most exciting impact on exports from the South West, either in terms of international presence, export growth, or exports as a proportion of sales. 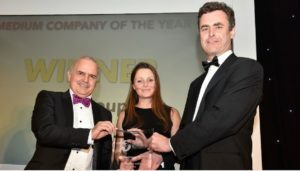 The Medium-sized Company of the Year award was awarded based on our success in international markets. Specifically, the judges were looking for businesses that have continued to innovate, faced down challenges, and developed opportunities that have delivered sustainable growth to the business. The future of UK engineering is in safe hands! July has been work experience month at Blackhill Engineering, who were fortunate enough to receive two outstanding young individuals. Throughout the week they worked on filing, tapping and grinding, machining, welding and even some 3d modelling. Work experience is acknowledged as a real benefit not only to the students, but also to the manufacturing industry. Raising awareness and engaging students at an early age provides engineering insight and also increases options for future career opportunities. Sadly, very few students will ever have the opportunity to see or experience a large fabrication workshop with heavy manufacturing equipment. At Blackhill Engineering, the students are initially encouraged to look around the workshops, talk to the staff and ask questions that will help them to decide if engineering is the career path for them. We are pleased to report back that most return to the office with a big grin and cannot wait to get started. All the team at Blackhill Engineering would like to pass on a huge well done and many thanks to Erin Fisher and Alfred Downs for your time, and also for the positive influence you have had on our business in such a short time. We wish you both the very best for the future. 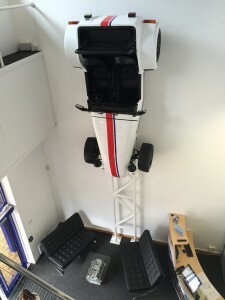 Goodridge Ltd, a world-leading manufacturing company based in Devon, recently tasked Blackhill Engineering to vertically mount a sports car on a wall. The super lightweight sports car will be the main centrepiece display of their new Reception area. Please click on the photograph below for a larger image.